Food is an important part of life here at Meduseld. It’s why growing natural healthy food is such a priority. And, it tastes better. The lamb just tastes GOOD. The children are gnawing fresh-picked carrots and talking about how sweet and juicy they are. The vegetables look and taste so wholesome. Today, we are going to cover another breakfast that is one of our favorites here, Country Eggs Benedict. If you are following paleo guidelines, you can omit the bread from this recipe. Otherwise, charge forward! For some of the ingredients I won’t list an amount, because it will depend on how many people you are cooking for. This applies in particular to bacon and bread. Generous bunch basil or other greens. This was homemade spelt bread, toasted in a skillet with olive oil. Fry the bacon – reserve in warm oven. Chop one large tomato. Chop basil (or spinach, arugula, or other greens of your choice). Saute in skillet with olive oil. Salt, pepper and garlic to taste. Add about one tablespoon balsamic vinegar. Once heated through, turn off heat and keep in warm place. Some recipes recommend a double boiler and I think this is the reason more people don’t make this delightful sauce. Let be honest, any mention of the double boiler and people think “this is going to be complicated” and that’d the end of it. I don’t use a double boiler and you don’t have to. I use a thick bottomed pot and the lowest heat. 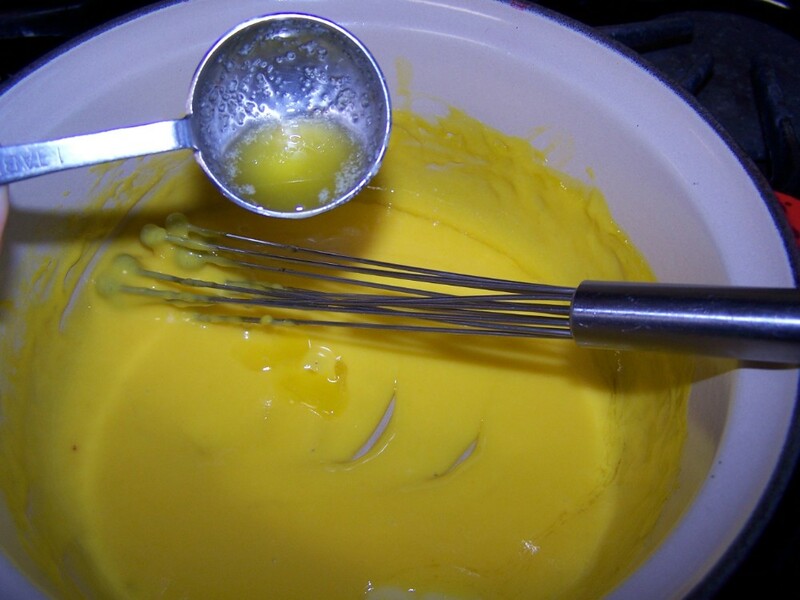 Over low heat, stir 3 egg yolks with juice from one/half lemon. Cut cold butter into pieces and as pan starts to warm, gradually add pieces of cold butter. Stir frequently. Don’t add another piece until the previous one is incorporated into the yolks. Most recipes call for unsalted butter, but we use Amish roll butter which is salted. I know its some culinary sin that would get me kicked out of Le Cordon Bleu, but you use what you have, right? The sauce will begin to thicken and once you can see the bottom of the pan, like this, turn off the heat. Take the melted butter and add one tablesoon at a time into the sauce. Stir well to incorporate each spoonful. Add salt and pepper to taste. Take a pan with a large surface area. Fill to only about 1/2 to 3/4 inch with water and add two tablespoons vinegar and one teaspoon salt. Bring to a simmer. If you boil the water, the eggs will break apart. What you need is simmering hot water so that the water is not disturbed. Break an egg in a small cup and gently pour it into the simmering water. The slower you are the more intact the egg will remain. allow the egg to start forming firm edges. 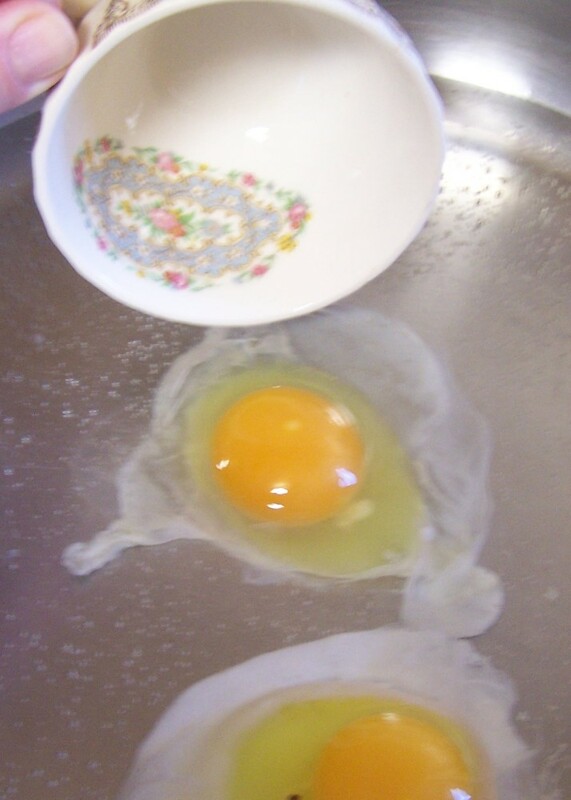 Once it has, you can start ladling some hot water over the egg, and this will firm up its surface. Cook until there are no clear parts left of the egg white. My apologies this photo is not clearer, but the lense kept steaming up from the simmering water. Now, assemble. Take reserved toast, bacon and place on plate. Ladle a hot poached egg onto the bacon. 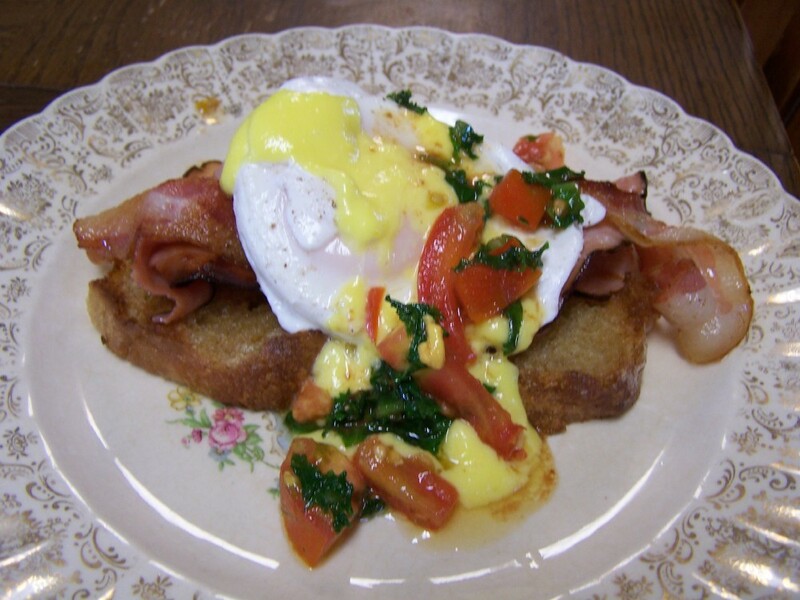 Place a couple spoonfuls of Hollandaise on the egg, and to top it off, a spoonful of the tomato-basil mix. Serve! There has been all sorts of activity at Meduseld these last few days, so it is time to catch up. With the burst of warm weather last week, some of the maples are starting to give sap. The best weather pattern for sap is freezing nights with above freezing temperature days. Once this cold snap moves through, we may be heading into ideal syrup weather. Stay tuned. Tomorrow should see some new items in the store. 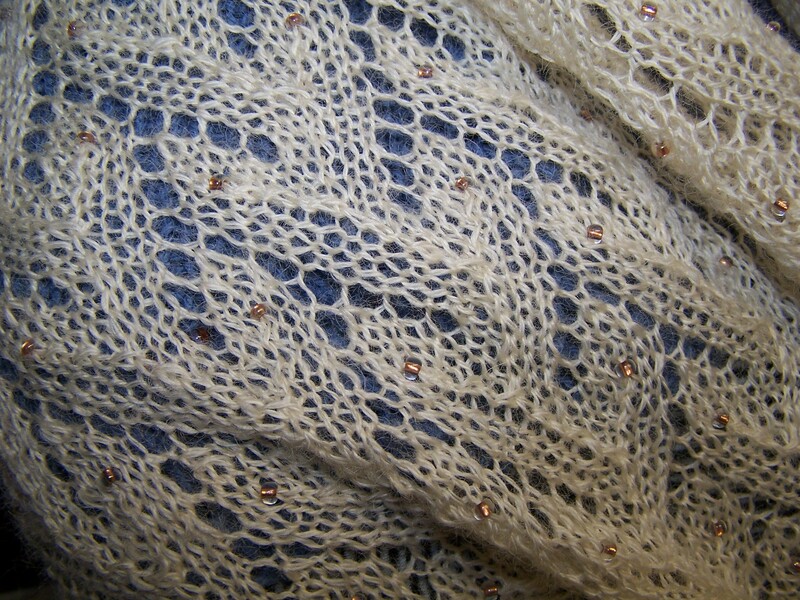 I have been wrapping up (pun intended) two shoulder shawls (wraps) to sell, and there will be a little more wool. Also, last week a large box of dyed wool went off to the fiber mill. We also butchered some older hens over the weekend, and continue to see progress in the chickens’ health since we added fermented feed to their diets. These stew hens were filled with the rich golden fat that makes such wonderful broths. We also had friends come to visit. During one of the visits our friend was sampling all the diverse lacto-fermented items we make here. 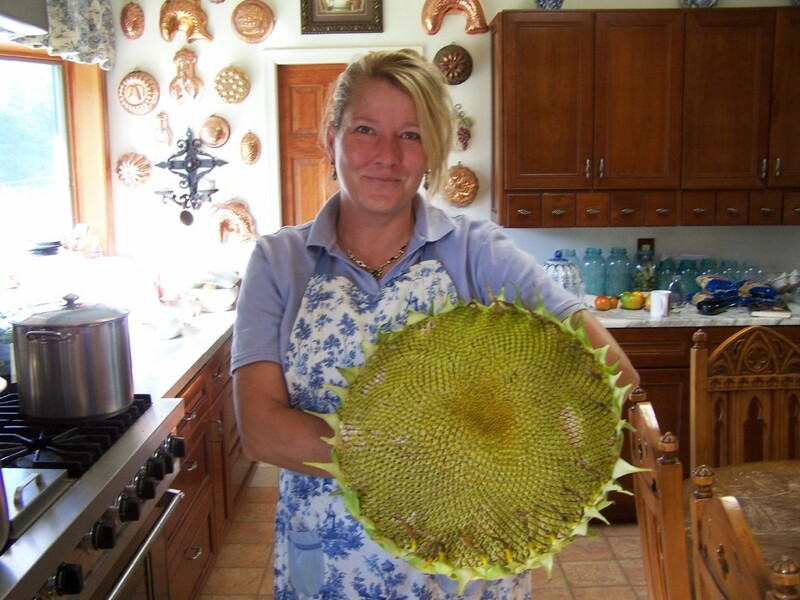 The idea came up for a lacto-fermentation workshop. If you live in the area and are interested, please email me and we’ll try to set up a date. For those who live further away, I will try to cover this topic thoroughly in a future blog. 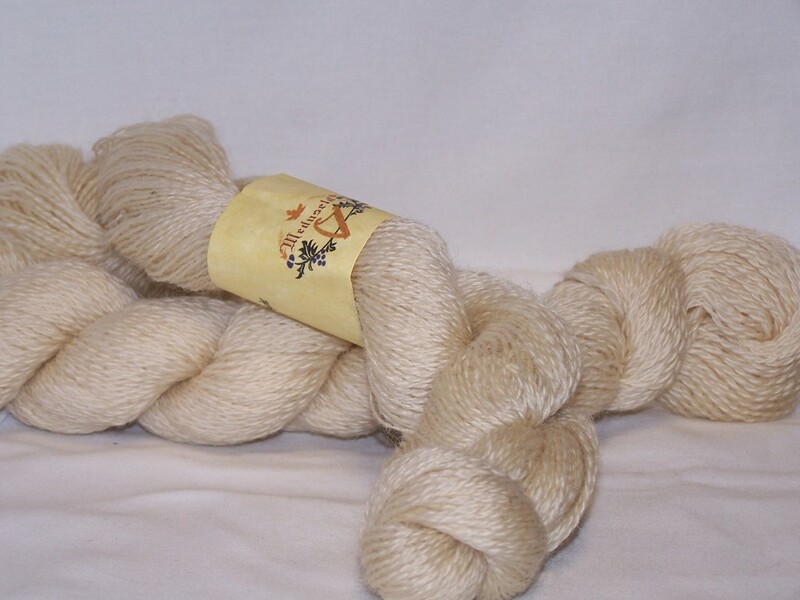 At fiber festivals you’ll sometimes hear people talk about the cost of custom wool yarns. “Yarn doesn’t cost this much at (pick your favorite craft store).” This post will show some of the differences and costs of store vs. custom yarns. Included in the custom yarns are the quality oriented yarn companies that you can find at yarns shops, as opposed to Walmart or Joann’s. That’s where the benefits end. Here’s where those fibres begin and it isn’t pretty. These yarns won’t decompose in the trash and they won’t break down for years in the environment. Additionally, synthetic yarns do not let your skin breath and they contribute to creating a demand for oil products and a dependence of foreign oil. Not good. When you consider the last disaster in the Gulf, maybe less oil is better. But let’s get back to why custom wool costs more. Synthetics don’t have to be shorn. 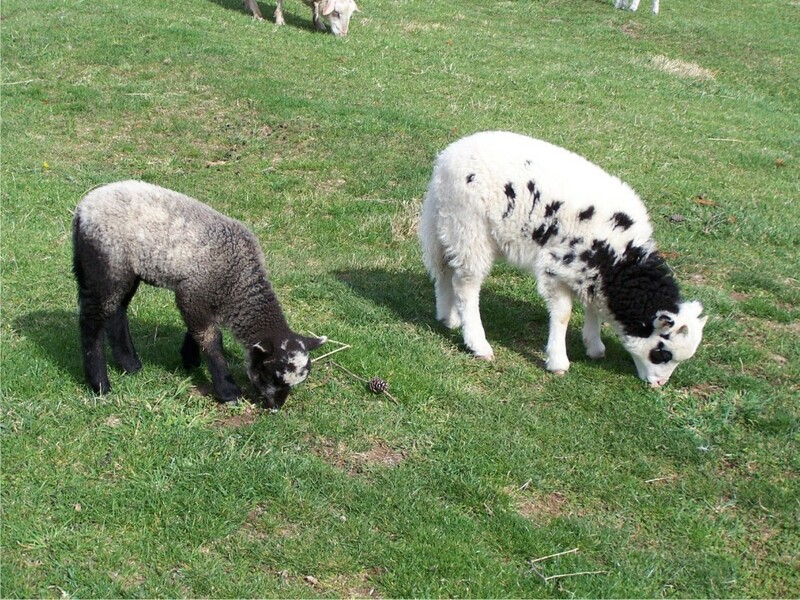 Each spring, the sheep are shorn of their fleeces. This benefits both the shepherd and the sheep, as the summer heat would be intolerable for the sheep with long fleeces. The going rate is $5-6.00 per sheep, and that does not include transportation. Each farmer has to budget for shearing day. Custom mills cost more per pound than corporations. If one were the head of Synthtic Yarn, Inc (fictional name) you’d approach to mega mill and get a cost of dollars per pound. When a small sheep farmer approaches a mill, it usually a straight $23.00 – $30.00 per pound, depending on the mill, the type of fibre and number of plies. If you were to send less than ten pounds to be processed, there is usually a surcharge for that. What all this means is that the standard four-ounce (quarter pound) skein of yarn is going to have to cost about $7.00 just to make up the cost of processing. That doesn’t include the cost of the fiber festival registration, the overhead and infrastructure of the farm, the feed, the shearing, the veterinarian, or last of all, a small income for the shepherd(ess). There are also the unexpected losses – my dear friend Eva lost her sheep to a bear last fall. Some of the more exclusive larger yarn companies have found ways to get around this by making their skeins smaller. I am holding a ball of yarn from S. Charles called Adele. It is 20 percent mohair; the rest is viscose, polyester, and polyamide. The weight of this ball is only 1.75 ounces, or 50 grams! The retail price on this little gem is $20.95! That’s over $160.00 per pound! Please support your local wool producers. It supports them, keeps local lands undeveloped and does not support oil dependence! Hoop houses are a wonderful way to extend the growing season, but what if you want to grow tropicals? 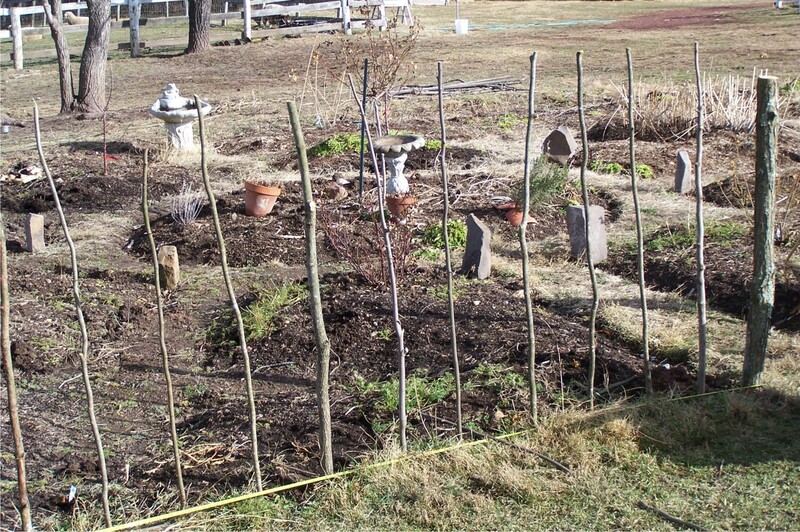 The winter temperatures would still destroy these tender sun-loving plants. But even in this area it is possible to grow a West Virginia banana. The answer is to build a conservatory. This a a picture of our conservatory. From the outside you cannot guess the treasure that lives within. It is a true living room, where beneficial soil bacteria, and insects are actually encouraged to grow. 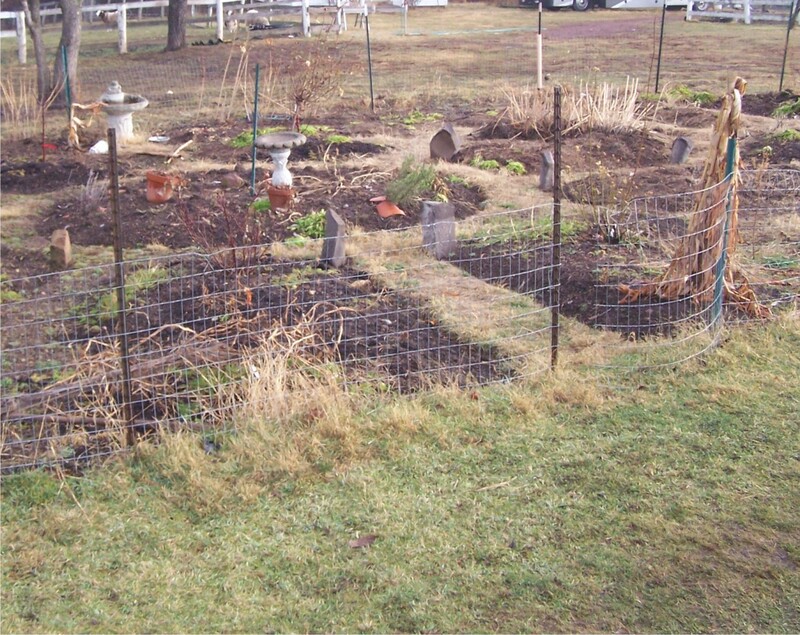 The goal is to obtain a small ecosystem that balances itself with beneficial insects so that pesticides don’t ever have to be used. Since we don’t sell any plants, we are comfortable with a higher level of insects than many people might tolerate. We have also released batches of various beneficial insects to address any insect problems that did arise. When you walk through this building, you find spider webs and frogs, a salamander hops into the little goldfish pond – it’s all very ALIVE. 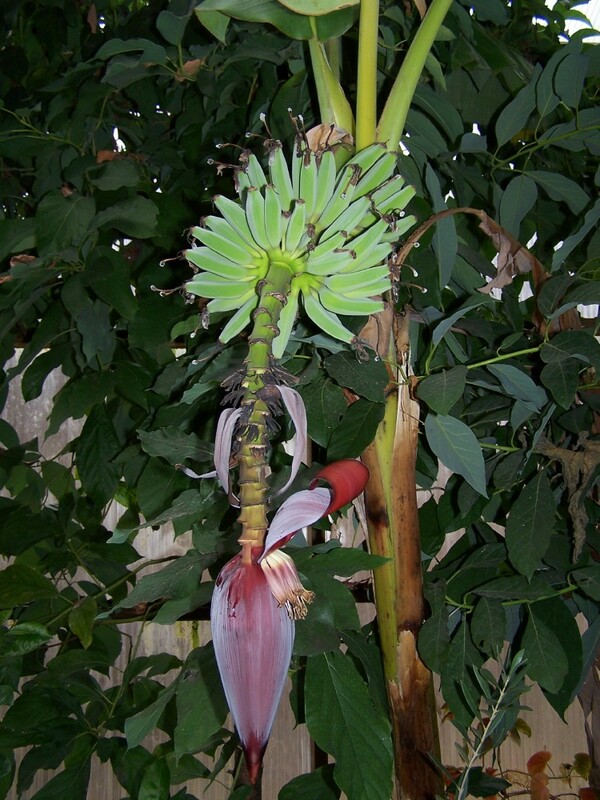 Here is a banana that is in “bloom,” called Musa Vente Cohol. It has pushed out immature banana clusters that will grow and ripen over the next several months. Behind, you can see an avocado tree that has not started to produce yet, despite being over 10 feet tall. 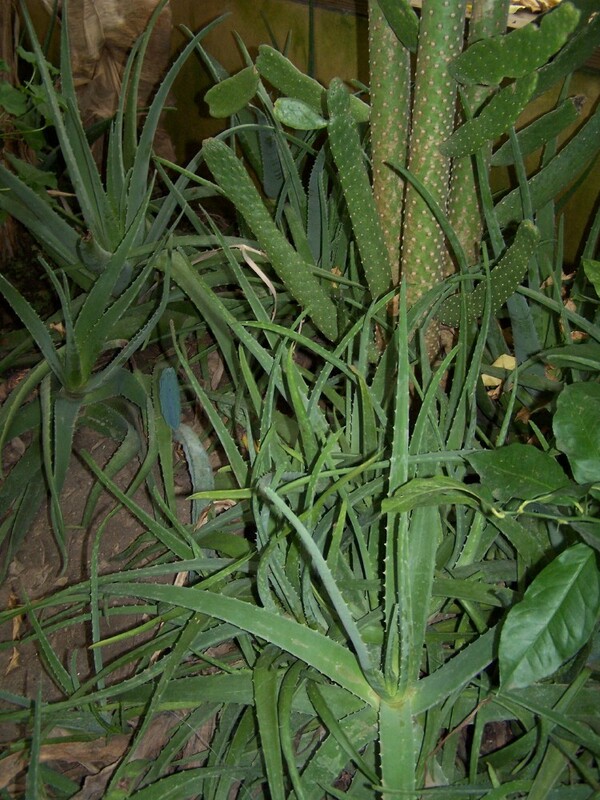 Here is a cluster of aloe vera growing in an area designated for more desert types of plants. This aloe vera is growing in the shadow of a cactus that is now about seven feet tall. 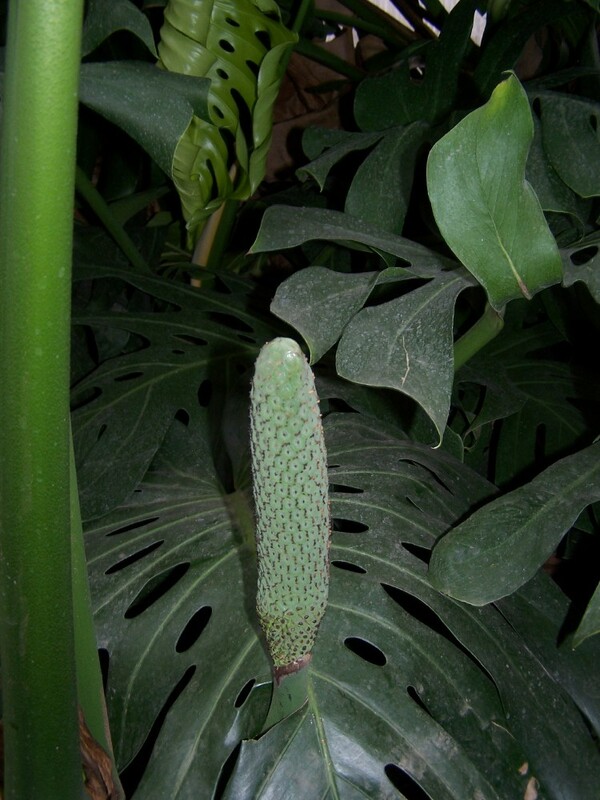 Here is a Monstera deliciosa producing a fruit. This kind of plant grows in the tropics and in some areas, like Hawaii, is considered invasive. It makes a gorgeous house plant, but in this case it is gradually taking over its corner of the conservatory. We regularly have to cut it back since it now sprawls over about 15 feet. 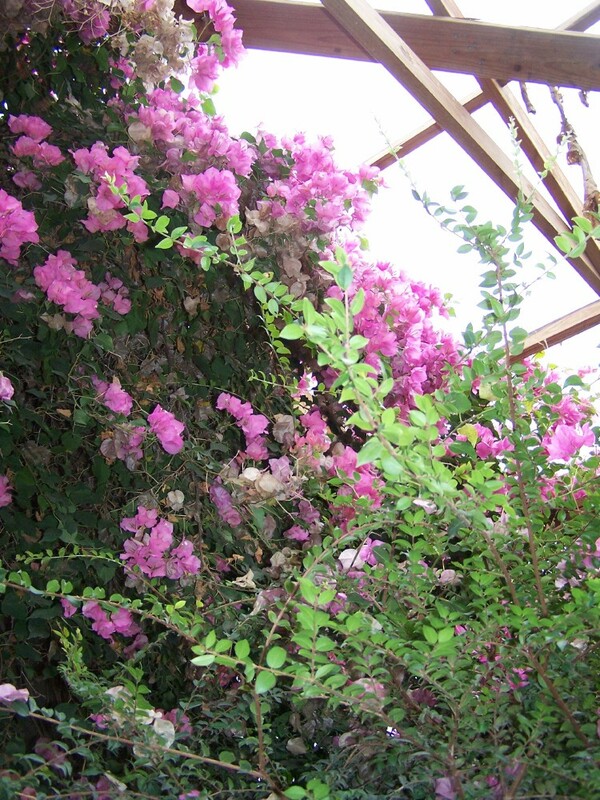 Another plant that has to be kept in check is the Bougainvillea. It is a thorny trailing plant that grows rather large and has paper like flowers in a bright fuchsia color. This plant grows in tropical climates, Florida, the British and U.S. Virgin Islands. It is said to have come from Brazil, where is grows abundantly. The Bougainvillea in this picture has to share its space with another Brazilian tree, the Jaboticaba. The Jaboticaba has an unusual way of growing its dark purple round fruits. Instead of hanging from the outer branches, the blossoms and eventual fruits come right out of the thicker parts of the trunk, looking like something Dr. Zeus might have thought up. Citrus also does very well in this protected environment. Lemons, limes, grapefruit, mandarin and orange trees are all included, and we are lucky to have a couple producing fruit right now. 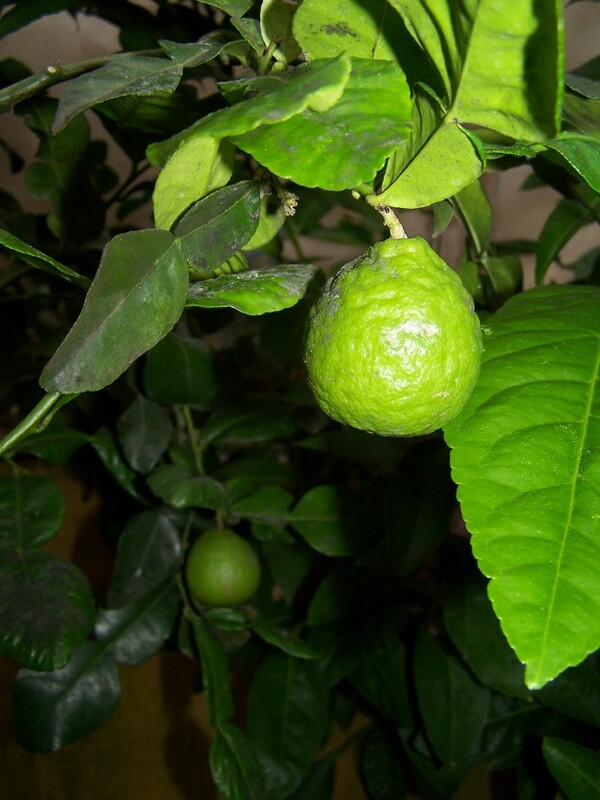 Both the Kefir Lime, used in traditional Asian cooking, and the Naval Orange, have fruit, and they bloom several times a year, filling this living room with perfume. Now for the techincal information. This conservatory was built on a cement and cinderblock foundation and was framed with 2×8 pressure treated pine. The center of the floor was left as dirt, and once the foundation was done several truck loads of compost and top soil were added. The trees and plants are planted directly in the ground. 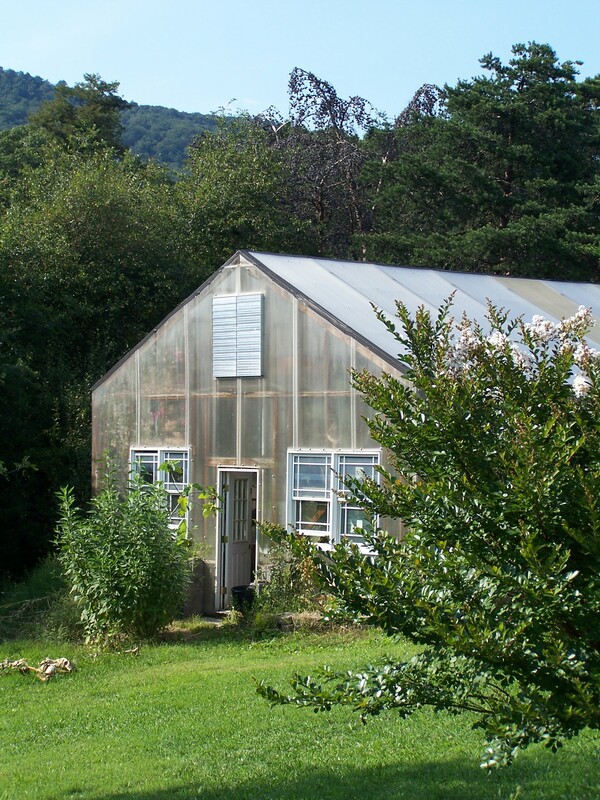 The walls are 3/4 inch polycarbonate, much thicker than greenhouse kits that are available. The conservatory, house and hot water are all heated with an outdoor wood burning furnace and this can be economical if you have enough wood so that you don’t have to buy it. In our case, we have enough forest that we can’t keep up with the standing dead trees, so for us this is feasible. we must use more wood, not less. 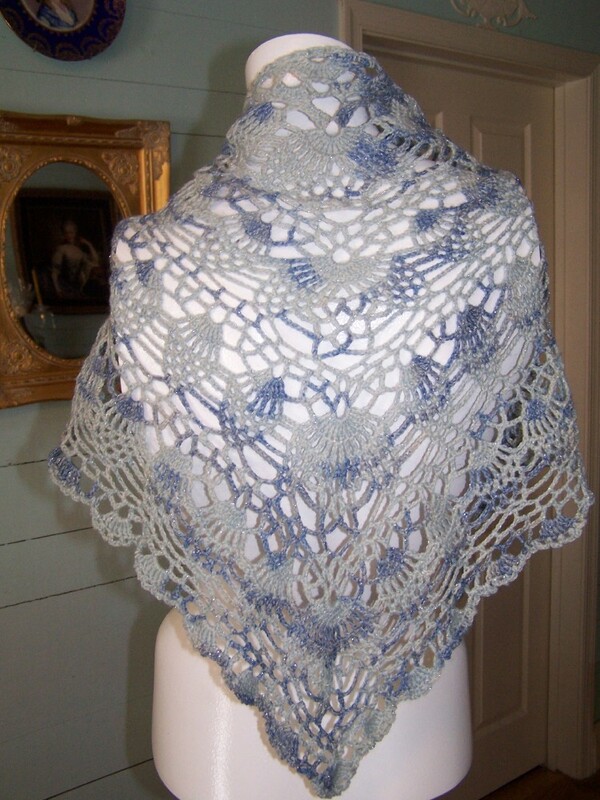 She made this with Meduseld’s Romney yarn in the fingerling weight (available in Meduseld’s Farm store). You can see in the second picture that she beaded the shawl as well. If you click on the pictures you can see the pattern enlarged. I’ve always drooled over the books of Estonian lace shawls, so this summer I decided to make one for my sister’s wedding. 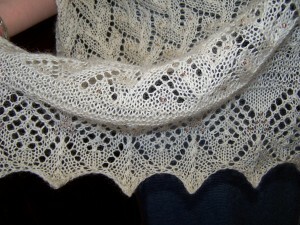 I found a pattern I liked in “Knitted Lace of Estonia,” by Nancy Bush: Madli’s Shawl (in Meduseld’s Amazon store). 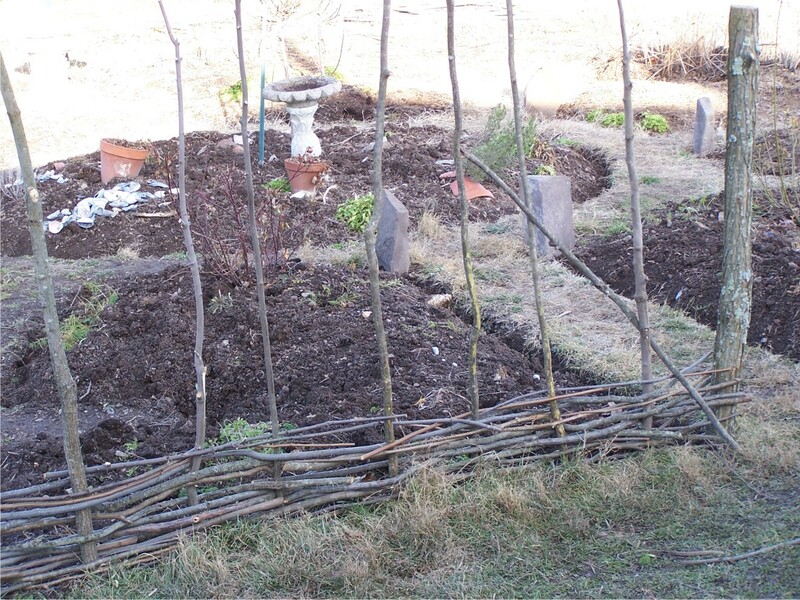 The center pattern is called Haga, which means twig, or small branch. The original pattern calls for nupps at the ends of the “twigs,” but I decided to put crystal beads with bronzey gold centers in their place, to add some weight and drape, and just a little sparkle. Check back for other posts about Kate. 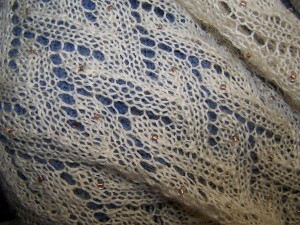 Soon, we will have another post with a pattern for a shawlette that was designed by Kate. Another winter acivity at Meduseld is preparing wool for hand spinning or for sending off to the fiber mill. Yesterday, I spent much of the day cleaning and dying wool. These batches of wool will be combined into a multi color yarn. 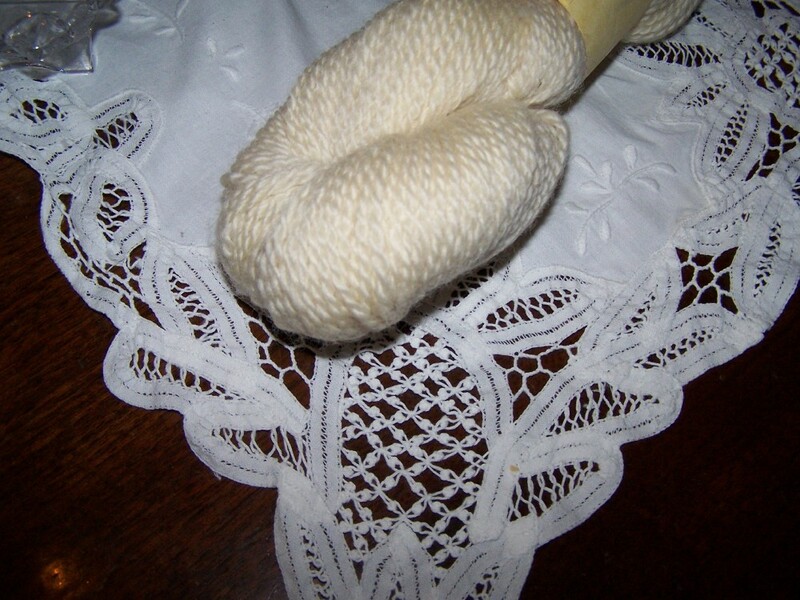 Following are the steps to clean and dye the wool. I took Royal’s fleece from last year. She is a lovely purebred Romney ewe who is friendly and always one of the first at the feed trough. 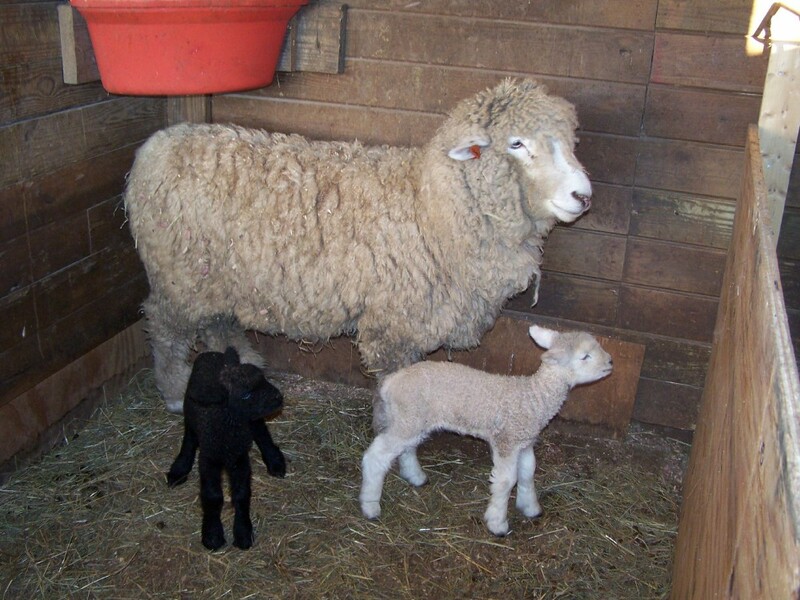 She produces a high sheen yarn and she makes about 8 pounds of fleece per year. 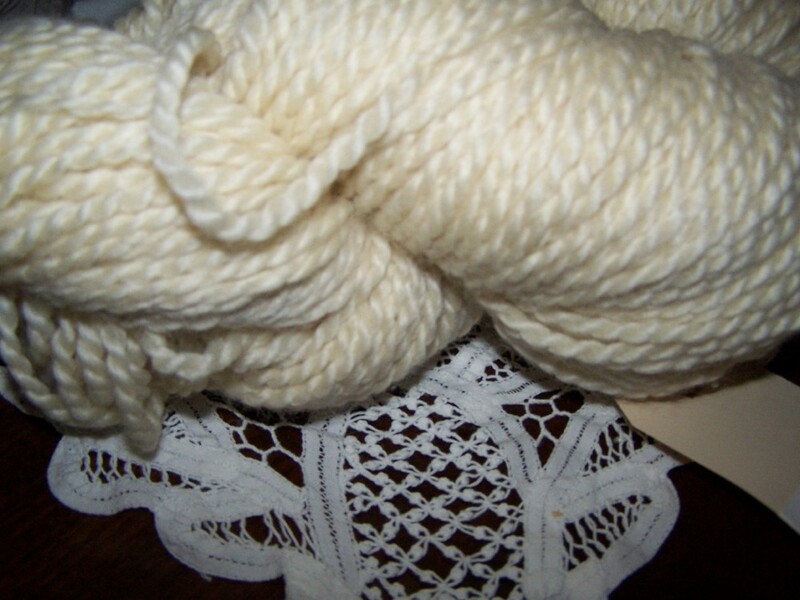 That is the weight before it is washed of its lanolin. Between that and the loss that always ocurrs during processing, we’ll end up with about half of that in yarn. First, take the fleece and wash it in the hottest water the tap will provide. Dawn dishwashing soap seems to be a favorite among wool enthusiasts, but we prefer to use organic detergents. Usually, we use Ecover which does a wonderful job removing the grease. You want to make sure you don’t handle the wool too much – its not like hand washing clothes. You want to move it about enough to get it to shake free the dirt and lanolin, but you don’t want to over compensate and felt your fiber. Felting just doesn’t come undone. Rinse several times with hot water until the water comes out clear. I don’t worry about making it crystal clear at this point since I am about to simmer the wool. Here is the cleaned fiber in a large stainless pot. It is important to use stainless or enamal cookware since we are going to be using Cushings Perfection acid dyes. You don’t want to have a chemical reaction with your pot or stirring spoon, and aluminum will react. I am using a stainless spoon, but I also have a wooden spoon that I reserve just for dying wool. 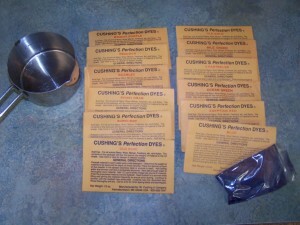 This is what the Cushing Perfection Dye packets look like. Each packet is costs around $3.00 and will color approximately one pound of wool, although I have had success with larger amounts. Cushing recommends 1/2 cup vinegar per pound of fiber, but you can use more. I used one cup of white vinegar that you can buy at any grocery store. A good pair of rubber gloves would handy, too. Combine boiling water, the dye packet and the vinegar. Try to eyeball how much water you’ll need to cover the amount of wool you are dying. Cushing says to wet the wool, but ours is already wet from washing. Now, quickly and smoothly, put all your wool in the pot. You have to be rather quick about it, or the portion you put in first is going to be darker than the part to go in last. 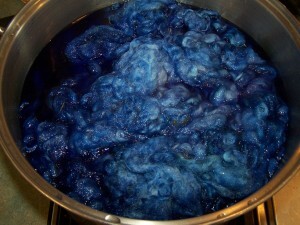 Stir the fleece around a bit and make sure that all parts are exposed to the dye liquid. Now, we are going to heat this back up to a simmer and let it stay that way until the wool absorbs the dye. You can see the difference, because suddenly the water will go from being richly pigmented, to suddenly looking almost clear, and your wool will have taken on the dye. It is very important to continue to gently stir periodically during this process so that you achieve even distribution of the color. 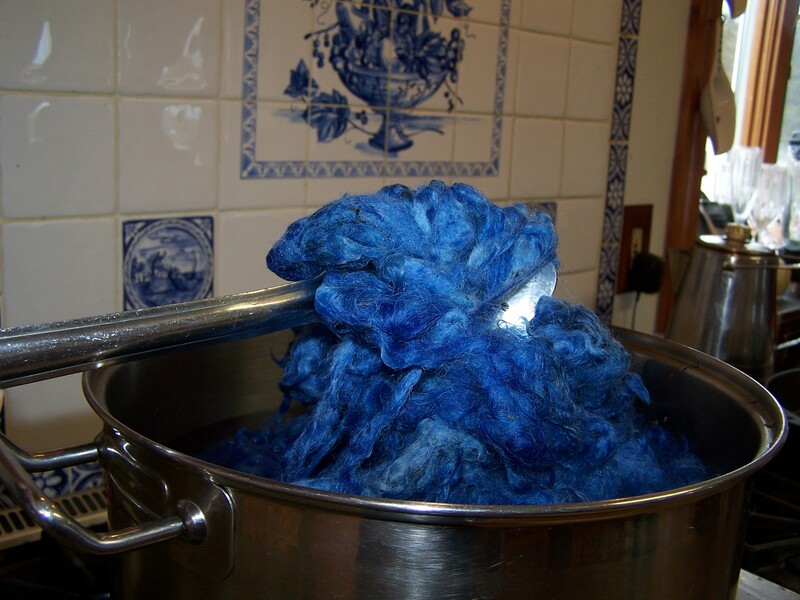 Here is a picture of my dye pot, and you can see around the edges that the water is still quite dark. 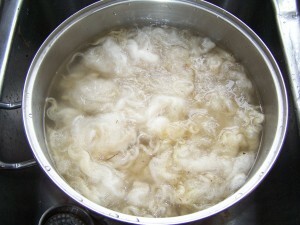 Cotinue stirring until the water clears and look for uniform color in your wool. This blue is turning out nicely, with deep bold coloring. Take the pot off the stove and drain the wool. Rinse several times in hot water until the water is clear. You don’t want to rinse in cold water because this might cause the wool to felt. It is important to make your temperature changes gradually. 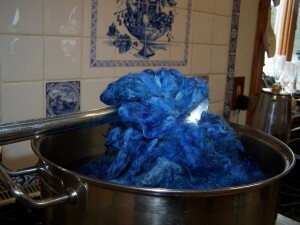 I make each rinse slightly cooler so that by the last rinse I can handle the wool. Now the wool goes out on the drying racks. This time of year it may take several days to dry, especially if the temperatures remain freezing. During the summer, it will dry overnight. Here I have several batches set out to dry. 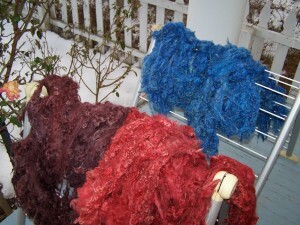 You can see Cushing’s Blue, Burgundy, and Egyptian Red drying on my porch. When these are dry enough to card, which means to comb the fibers, I’ll have a post on carding and spinning to make a multi-colored yarn.